The new Kings Heath Village Square was opened on 15 October 2011 and has its own Facebook page. The central feature of the Village Square is a labyrinth, but there are other artworks to be seen. 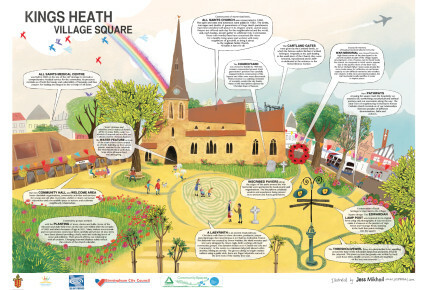 For example, the Village Square Interpretation Panel was installed in the Village Square in February 2013. The beautiful colourful design was created by local illustrator Jess Mikhail. The panel depicts a panoramic view of the square and its environs and offers short explanations about the main features.